Day 4 was my last day in Minnesota. 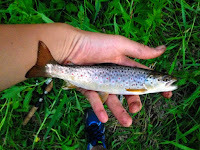 Kyle and I arranged to go fishing with Greenwood, a little ways from the twin cities. 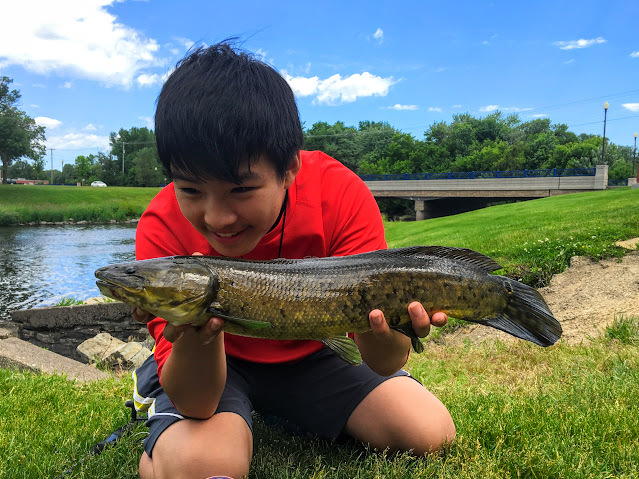 After about an hour, we met up with him, and after some discussion, decided to fish for bowfin first, which I needed for my lifelist, and Kyle and Greenwood needed for the contest. 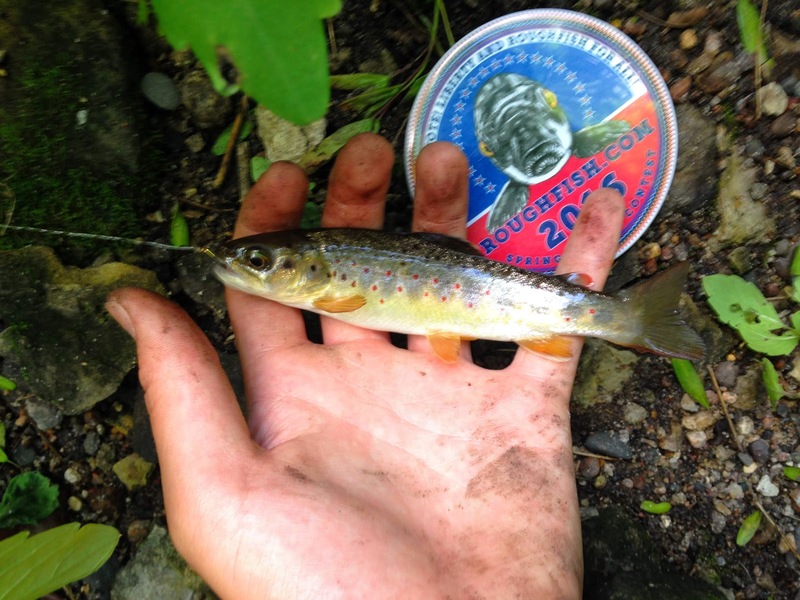 We had some matters to take care of first: Kyle's lifer green sunfish. Greenwood brought us to his sure-fire green spot, and Greenwood and I opted to cheer Kyle on, as to prevent one of us from stealing his lifer. It took a bit longer than expected, but soon enough Kyle had a beautiful green sunfish and we left to find the bowfin. I had my remnant golden shiners from the previous day of pike fishing, so after some chops, they became cut bait. Kyle proved to be the bowfin attractant on Day 4, and he hooked up in about half an hour, on a far cast to the other side. 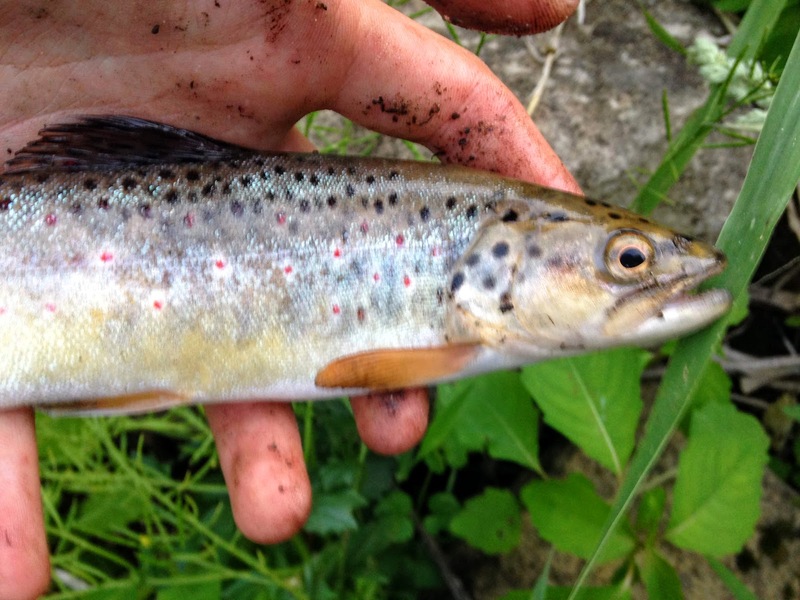 He brought in a beautiful post-spawn male, with faded remnants of green and turquoise on its belly and fins. Such beautiful fish. Because his fish was caught so near the other side, the whole group decided to make a move. That was a good choice, because Kyle quickly caught a very nice 'fin, 25 inches! It was a personal best for him. 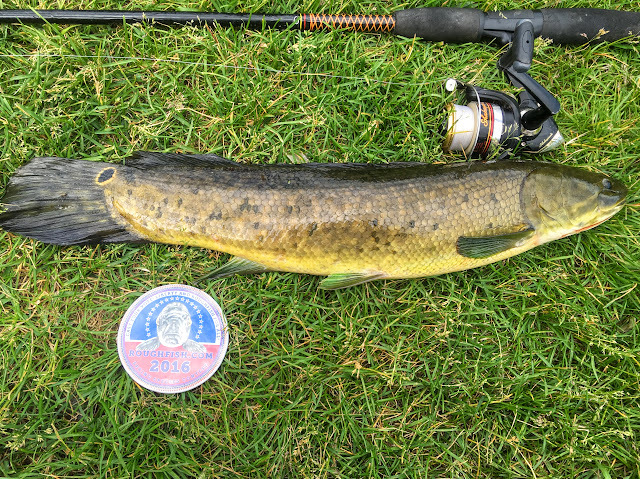 It was now up to me and Greenwood to catch a bowfin. Kyle, being ever so generous, relinquished his rod to me in my quest for a lifer. Wouldn't you know it, its wasn't too long until his rod started bouncing and I grabbed it. Unfortunately, the fish got unpinned halfway through the fight, a common occurrence with bowfin due to their armor-like jaws. Meanwhile, Greenwood hooks up, but the bowfin comes off almost immediately. 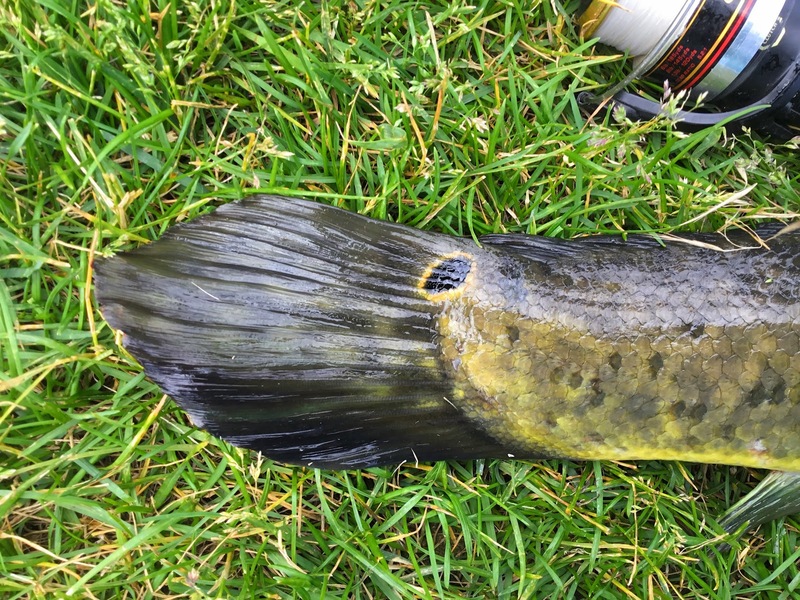 It is a little while before we see any more bowfin action, and meanwhile Kyle catches some black bullheads while searching for a yellow bullhead contest entry. Suddenly, his rod doubles over and I grab it, giving the fish a strong hookset. The fish was full of hatred and vigor, fighting like it was on steroids, even jumping once or twice. Soon, though, it was in the net. 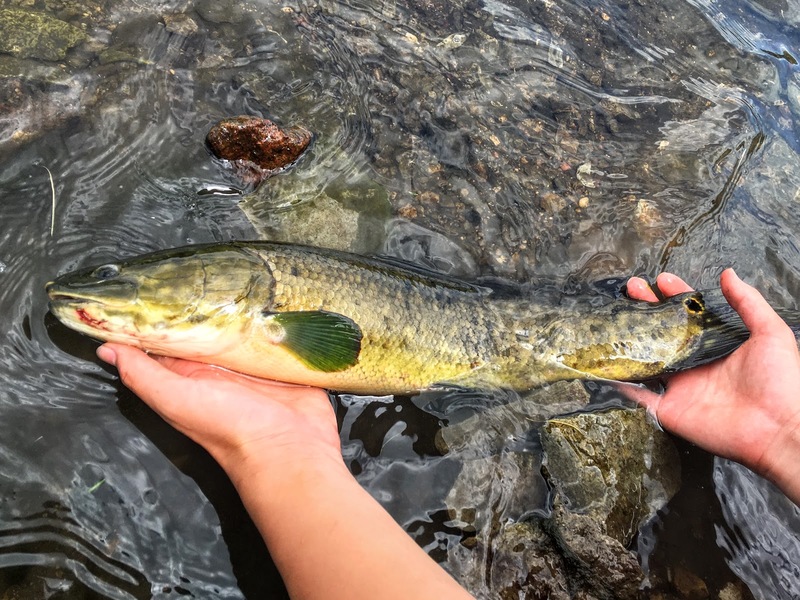 I had a bowfin in my hands! Amia calva, species #65! This was my first dinosaur, and I got hooked immediately. I just cannot get over how insanely awesome these fish are! It was up to Greenwood to catch a bowfin now. We waited... and waited... and he hooked one! Promptly lost it though... oh well. Then he hooked another! And lost it yet again. 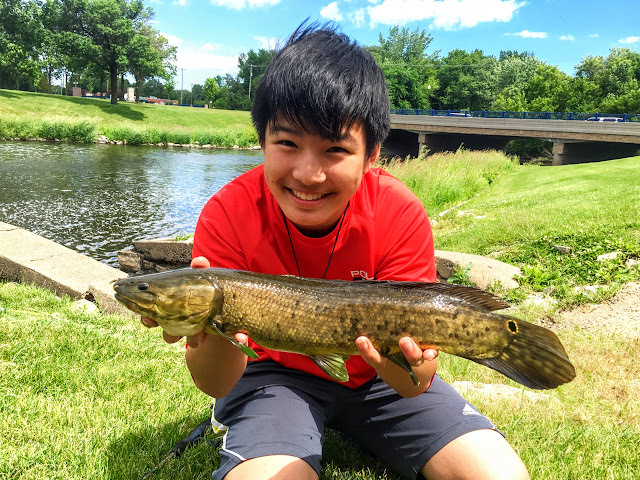 Finally, he hooked up on a solid fish... a pike?!?!?! Oddly on bottom fished cutbait. 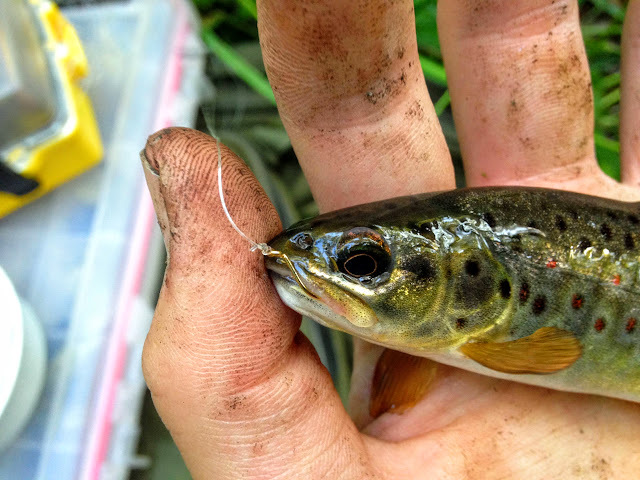 I scooped it up with the net, but as I lifted it up, the pike face downward, and before any of us new what was happening, it drilled a hole in the net, wiggled through, and got away. Greenwood was cursed. We chose to leave, since we had spent a great deal of time there and it was relatively close to Greenwood's house. 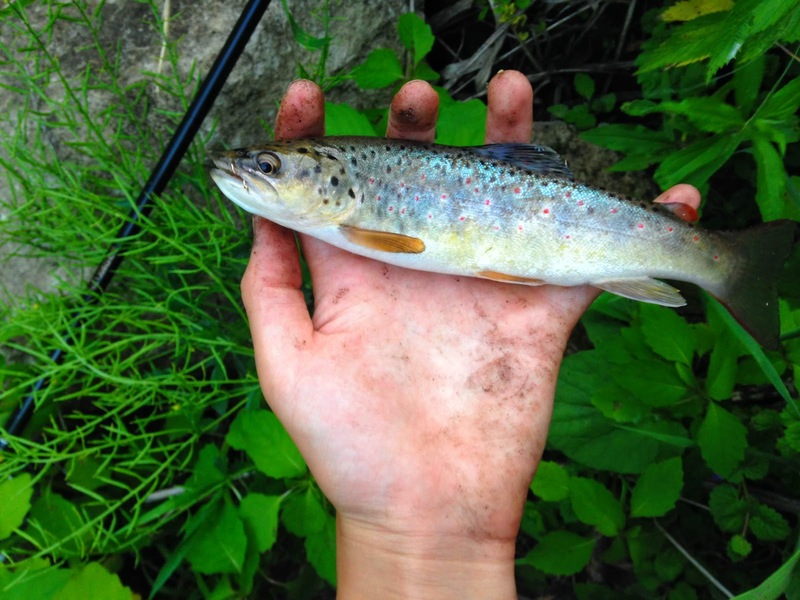 We headed over to a wild trout stream to nab some brown trout. Kyle got his very quickly, and after a little while, I eventually got one as well. Me and Kyle were absolutely nailing them, both of us catching plenty. Meanwhile, Greenwood could not find a trout to save his life. These weren't native, but they were wild and very pretty. 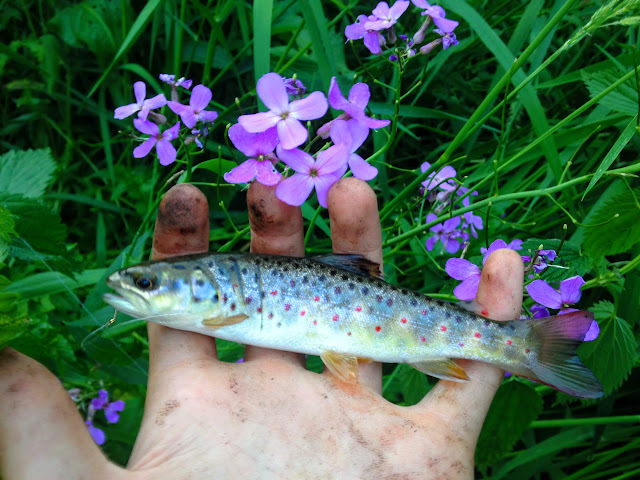 Out of a tiny mountain stream, these fish were small and gorgeous, me being glad to be catching browns again, after my first brown a couple years back. 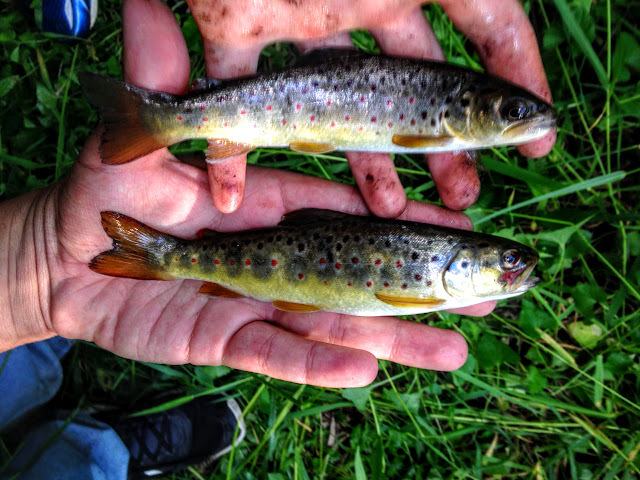 Kyle and I even got a double on wild browns! Finally, Greenwood got a small brown and the curse was lifted. We left to pursue some rougher species. We moved on to find some redhorse and mooneyes. Neither cooperated, although Greenwood hooked what may have been a greater, and Kyle hooked a carp but lost it as well. Then Kyle got a white sucker. Although it wasn't the hottest action, the day was beautiful and it was great to be out on the water. 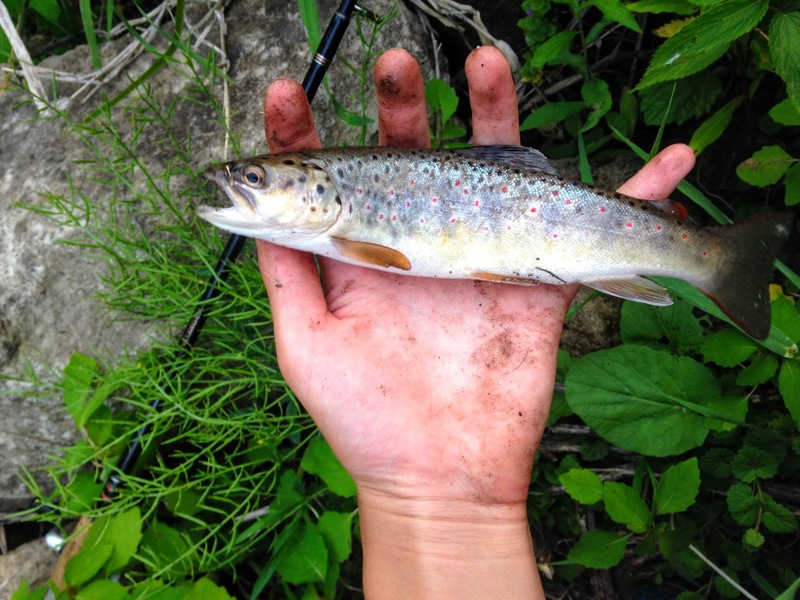 We stopped to find some brookies, but oddly enough, all we caught were browns! 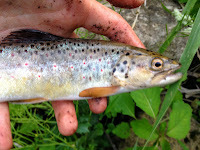 Greenwood said he had never caught browns at this location before, but unfortunately, no brookies were to be had. 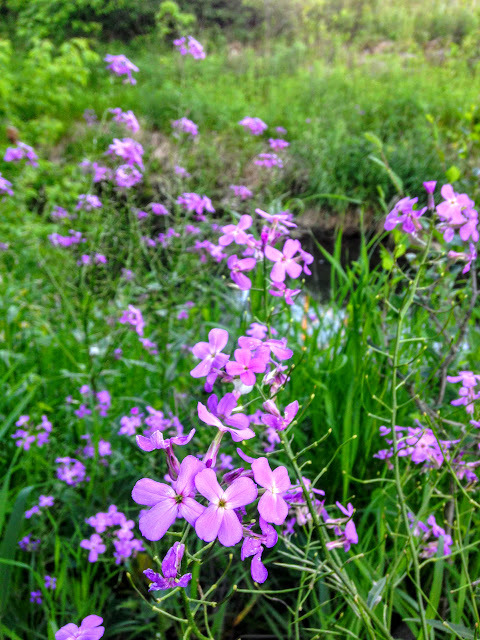 The flowers were stunning, however, and the stream was clear and loaded with fish. I guess today was a day peculiarly suited to odd events. Kyle managed to catch a yellow perch, a bluegill, and a creek chub in a place were all are very rare! We made a quick stop for mooneyes, but didn't succeed, and Kyle and I bid farewell to Greenwood and headed back. The trip was over. 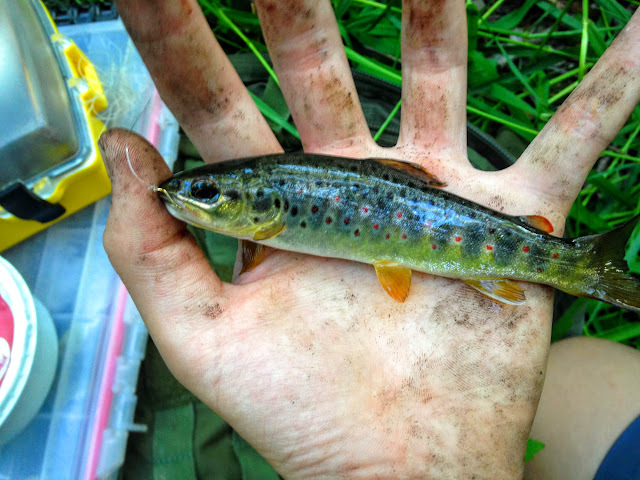 8 new species, 16 species caught total. I had a ton of fun. First and foremost, I want to thank my parents for organizing this entire trip and making it possible. It would not have happened if it wasn't for them. Also, many thanks goes to my aunt and uncle, who welcomed me into their home and accommodated my hectic fishing schedules. Not only that, but they willingly drove me around, got me bait, and despite tough times, wanted me to have the best experience possible. I owe a huge debt to Esther, who, in times of hardship, immediately accepted me host me and cooked me delicious meals. She was kind and generous, and i can't wait to see her again! 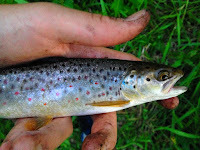 Also thanks to all the guys who helped me on my fishing journey, special thanks to Kyle, Greenwood, Tony, and Waxworm. The fish I caught were almost entirely due to them. Glad to see you caught a bowfin! They are truly amazing fish, keep up the good work!